I’ve always been in love with sunflowers. 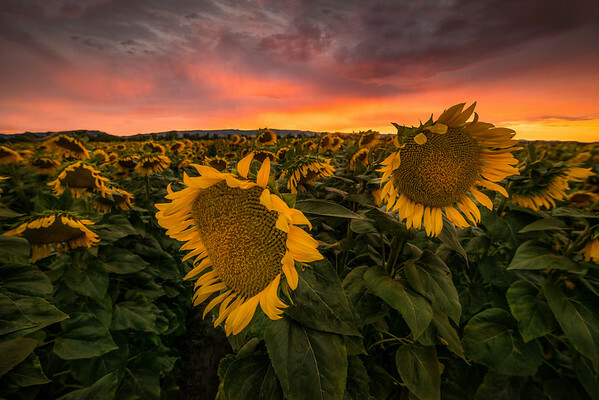 One of my earliest memories is from pre-school where I would make the teachers pick me up so I could grab the seeds from the few sunflowers that grew near the playground. During high school we would eat sunflowers while I sat waiting as designated pinch runner on the baseball team. When I drove by the sunflower fields near Sacramento a few years ago I knew one day I’d have to get some photos of them! Unfortunately last summer was a cloudless summer and there really weren’t any opportunities to photograph the sunflower fields. This year, despite the drought, has had a number of beautiful summer monsoonal sunsets. The weather forecast looked juicy and Cmdr Acosta even came out of hibernation to join Willie, Alan, Ropelato and I at the sunflower fields. Virga filled the sky as we drove and we prayed that the horizon wouldn’t be so thick that it blocked sunset light. Once at the fields we ran around like chickens with our heads cut off trying to find the best patch of sunflowers. They were slightly past their prime with shriveled up leaves and droopy heads but that didn’t stop us. When the sky lit up beautifully we were ready to capture it. Running from composition to composition can sometimes get a bit hectic and in my rush I forgot to “focus stack”: focus on multiple areas both near and far to ensure the entire scene is in focus. Some of you may prefer this photo to be sharp front-to-back but I actually preferred the blurred background ... it locks the eye on the 2 sunflowers in the front. What do you prefer? Deep depth of field or the shallow one?